What with many of us getting misty-eyed over the loss of the Superman-Lois Lane marriage, I thought I'd present a story that many of you (especially the young'uns) might never have seen. Back in the day, Superman was so popular that not only did he have two titles (three if you count Superboy) but his girlfriend Lois Lane and pal Jimmy Olsen had their own spotlight series as well. 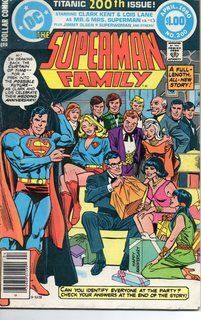 Eventually, however, sales on these ancillary titles dropped enough that DC decided to merge them along with some other characters into one big book entitled "Superman Family." It kept the numbering of "Jimmy Olsen" , and eventually reached #200. As a celebration of this milestone, the magazine had an extra-long imaginary story, depicting the future marriage anniversary of Clark Kent and Lois Lane. I've tried to stick as closely as possible to the 1/3rd rule, so extreme choppiness ahead. Next time, more public domain!